J. Braithwaite (2017) ‘Responsive Excellence’ in C. Coglianese (ed) Achieving Regulatory Excellence. Washington: Brookings Institution. J. Braithwaite and S. Hong (2015) ‘The Iteration Deficit in Responsive Regulation: Are Regulatory Ambassadors an Answer?’ Regulation & Governance 9(1), 16-29. J. Braithwaite (2015) ‘Responsive Excellence’. Paper Prepared for the Penn Program on Regulation’s Best-in-Class Regulator Initiative, June 2015. S.H Hong J. Braithwaite (2012) ‘Reconfiguring regulatory institutions: learning from diplomacy and indirect reciprocity’ Jerusalem Papers No. 45, July 2012. J. Braithwaite (2011) ‘The essence of responsive regulation’ UBC Law Review 44(3), 475-520. J. Braithwaite (2009) Leading from behind with plural regulation in Judith Healy & Paul Dugdale (eds) Patient Safety First. Sydney: Allen & Unwin. 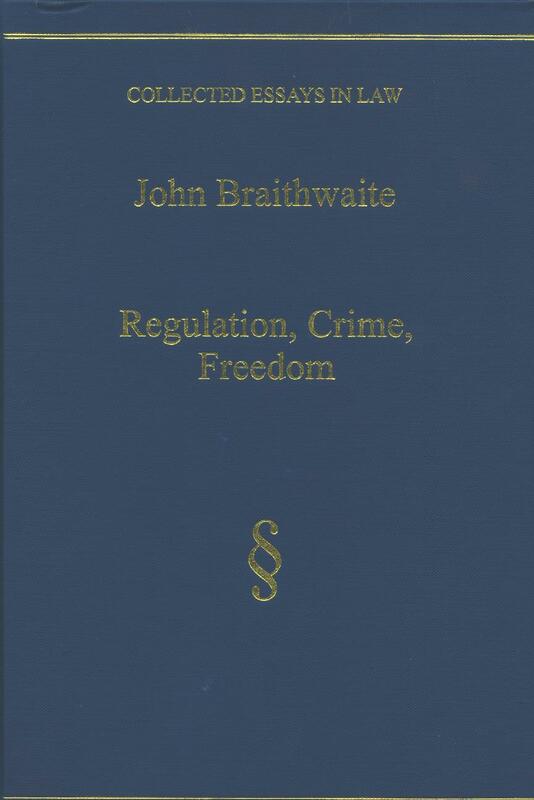 J. Braithwaite (2009) ‘The Regulatory State’ reprinted in R. Goodin (ed.) The Oxford Handbook of Political Science. New York: Oxford University Press. J. Braithwaite & Peter Drahos (2009) Global business regulation in Simon Halliday & Patrick Schmidt (eds.) Conducting Law and Society Research. New York: Cambridge University Press. J. Braithwaite (2006) The Regulatory State? in R. Rhodes (ed.) The Oxford Handbook of Political Institutions. Oxford: Oxford University Press. J. Braithwaite (2009) ‘Restorative Justice’ in H.J. Schneider (ed.) International Handbook of Criminology. Berlin: Walter de Gruyter. J. Braithwaite (2005) ‘For Public Social Sciences’ British Journal of Sociology 56(3), 345-347. 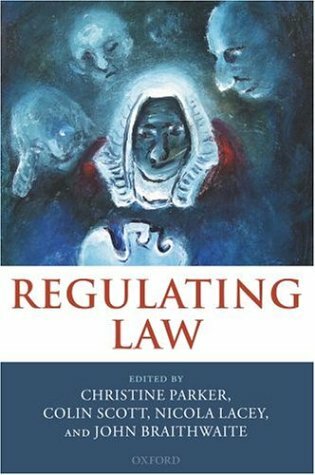 C. Parker, C. Scott, N. Lacey & J. Braithwaite (eds) Regulating Law. Oxford: Oxford University Press. J. Braithwaite (2004) ‘Methods of Power for Development: Weapons of the Weak, Weapons of the Strong’ Michigan Journal of International Law 26(1), 298-330. J. Braithwaite (2003) Restorative Justice and Corporate Regulation in Elmar G.M. Weitekamp and Hans-Jürgen Kerner (eds) Restorative Justice in Context. International Practice and Directions, 161-172. Devon, UK: Willan Publishing. C. Parker and J. Braithwaite (2003) Regulation in Peter Cane and Mark Tushnet (eds) The Oxford Handbook of Legal Studies, 119-145. Oxford: Oxford University Press. J. Braithwaite (2002) ‘Rewards and Regulation’ Journal of Law and Society 29(1), 12-26. J. Braithwaite (2002) ‘Rules and Principles: A Theory of Legal Certainty’ Australian Journal of Legal Philosophy 27, 47-82. Abstract also available here. J. Braithwaite (1999) ‘Accountability and Governance Under the New Regulatory State’ Australian Journal of Public Administration 58, 90-93. J. Braithwaite and P. Drahos (1999) ‘Ratcheting Up and Driving Down Global Regulatory Standards’ Development 42 (2), 109-114. J. Braithwaite (1998) Institutionalizing Trust: Enculturating Distrust in V. Braithwaite and M. Levi (eds) Trust and Governance. New York: Russell Sage. J. Braithwaite (1994) ‘A Sociology of Modeling and the Politics of Empowerment’ British Journal of Sociology 45, 445-479. J. Braithwaite (1994) Prospects for Win-Win International Rapprochement of Regulation in Organization for Economic Corporation and Development, Regulatory Co-operation for an Interdependent World. Paris: OECD. J. Braithwaite (1994) Lessons for Regulatory Co-operation in Organization for Economic Corporation and Development, Regulatory Co-operation for an Interdependent World. Paris: OECD. J. Braithwaite (1994) Regulation in K Wiltshire (ed.) Governance and Economic Efficiency. Sydney: Committee for the Economic Development of Australia. J. Braithwaite and J. Murphy (1993) ‘Clout and Internal Compliance Systems’ Corporate Conduct Quarterly 2, 52-62. J. Braithwaite (1993) ‘Responsive Business Regulatory Institutions’ in C. Coady and C. Sampford (eds) Business, Ethics and the Law, 83-92. Sydney: Federation Press. (Reprinted in Trade Practices Commission Bulletin No.77, 1994, 2-8). J. Braithwaite (1993) Juvenile Offending: New Theory and Practice in L. Atkinson and S. Gerull (eds) National Conference on Juvenile Justice. Canberra: Australian Institute of Criminology. J. Braithwaite (1993) Improving Compliance: Strategies and Practical Applications in OECD Countries. Paris: OECD [report]. 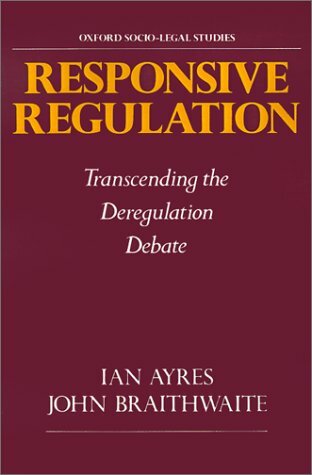 I. Ayres and J. Braithwaite (1992) Responsive Regulation: Transcending the Deregulation Debate. Oxford: Oxford University Press. I. Ayres and J. Braithwaite (1992) ‘Designing Responsive Regulatory Institutions’ The Responsive Community Summer, 41-47. I. Ayres and J. Braithwaite (1992) ‘Partial Industry Regulation: A Monopsony Standard’ California Law Review 80, 1992, 13-53. I. Ayres and J. Braithwaite (1991) ‘Tripartism: Regulatory Capture and Empowerment’ Law and Social Inquiry 16(3), 435-96. J. Braithwaite (1991) Policies for an Era of Regulatory Flux in B. Head and E. McCoy (eds) Deregulation or Better Regulation. Melbourne: Macmillan. J. Braithwaite (1990) ‘Convergence in Models of Regulatory Strategy’ Current Issues in Criminal Justice 2, 59-65. J. Braithwaite (1987) ‘Negotiation Versus Litigation: Industry Regulation in Great Britain and the United States’ American Bar Foundation Research Journal 2, 559-574. J. Braithwaite and Brent Fisse (1987) Self-Regulation and the Control of Corporate Crime in C. Shearing and P. Stenning (eds) Private Policing, Vol 23 Sage Criminal Justice System Annuals, 221-246. Beverly Hills: Sage. J. Braithwaite (1987) Self-Regulation: Internal Compliance Strategies to Prevent Crime by Public Organizations in P. Grabosky (ed.) Government Illegality. Canberra: Australian Institute of Criminology.